Rona Nesbit of the Pittsburgh Cultural Trust, Maureen Haggarty of Family Hospice, and U.S. District Judge Maurice Cohill. The sun appeared over the horizon. There was hardly a cloud in the sky and just the gentlest mild breeze blew through the trees. The birds were chirping. It had the makings of a beautiful, memorable September day. He was right. George had the best score of the day and – as was their tradition – was rewarded by his friends treating him to lunch. The golf outings that George enjoyed with his friends had been a bi-weekly tradition in the spring, summer and fall for several years. The fact that they were all retired gave them time to do what they enjoyed with family and friends. George cherished these times. Little did he know that morning that he would enjoy only a few more outings on the course. George is a congestive heart failure patient and his condition has slowed him down to the point of decreased physical capability. He is nearing end-of-life and some of the things he did last fall are now impossible. As a patient of Family Hospice and Palliative Care, George is cared for by a team of experts specially trained to anticipate and treat his symptoms. He and his loved ones take advantage of supportive services such as Reiki therapy and recording his video life story as part of our Quality of Life program. As an independent community-based non-profit organization, Family Hospice relies on support from benefactors to keep many of our programs up and running. Some of our services are not Medicare or insurance reimbursable. Our fundraising plays an important role in keeping these services viable. One such fundraiser is our annual Golf Benefit. On May 7, Family Hospice celebrated our 25th anniversary golf outing at Valley Brook Country Club in McMurray. In its first 24 years, the Golf Benefit has raised $1.6 million – all of which benefits patient and family services like the ones described above. One hundred-twelve golfers took to the course on an ideal day for our silver anniversary event. Their participation, along with the work of our Golf Committee and many volunteers, made for a huge success. We are grateful to every one of them for their support. After golf, participants enjoyed a silent auction with in-demand items such as an autographed Sidney Crosby jersey, use of a lake house in Chautauqua, NY, and more. 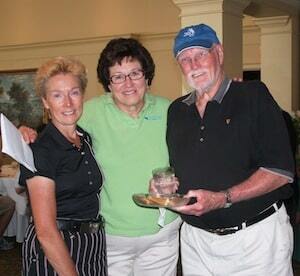 The money raised at our Family Hospice Golf Benefit helps patients like George enjoy improved quality of life. He may not be able to hit the greens like he used to – but he is able to look forward to the care and services that make each day worth living. And, he plans to enjoy a few more lunches with his friends. Rafael J. Sciullo, MA, LCSW, MS, is President and CEO of Family Hospice and Palliative Care and Past Chairperson of the National Hospice and Palliative Care Organization. He may be reached at rsciullo@familyhospice.com or (412) 572-8800. Family Hospice and Palliative Care serves nine counties in Western Pennsylvania. More information at www.familyhospice.com and www.facebook.com/familyhospicepa.